Revive, refresh and awaken your mind and body with this wonderful lemon-scented hand-made soap combining essential oils of Lemon, Lemongrass, May Chang and Cedarwood Virginian infused with moisturising Olive Oil, Palm Oil and Coconut Oil. To luxuriously soothe, pamper and nourish your skin, this natural botanical soap is enriched with the finest Shea Butter - the ultimate in natural moisturising nut butters. The refreshing aroma and gentle astringent and toning action leaves you feeling fresh and revitalised thanks to the synergistic blend of stimulating essential oils. The luxurious rich and creamy lather produced by our gentle, long-lasting soaps will leave your skin clean, velvety soft, and lightly scented. As well as being a natural antibacterial, May Chang is also an effective deodorant making it perfect for showering and baths. The wonderful sparkling lemon-fresh aroma brightens up the dullest day also means that this a cleansing bar the guys in your life will love too! All three of the essential oils in this soap possess powerful antiseptic, toning and deodorant properties, plus Lemongrass essential oil tones the skin and helps to normalise overactive sebaceous glands, making it perfect to balance oily, acne-prone skin. 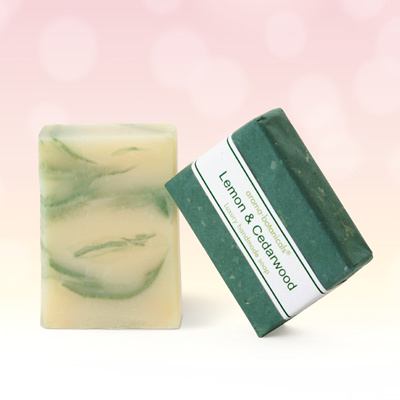 Lemongrass is one of the most powerfully antiseptic of all essential oils, and ideal for a natural antibacterial soap. Sodium olivate, Sodium palmate, Sodium cocoate, Aqua, Butyrospermum parkii, Glycerin, Prunus dulcis, Sodium castorate, Citrus limonum, Cymbopogon flexuosus, Litsea cubeba, Juniperus virginiana, CI 77288.